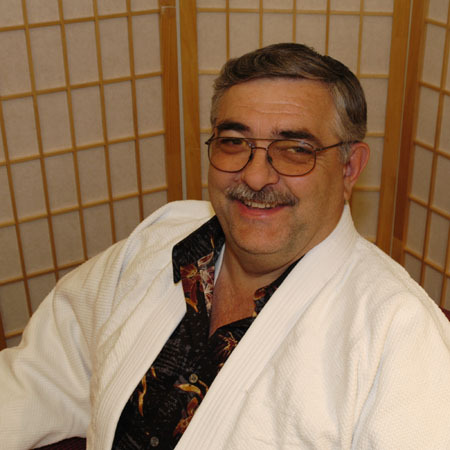 Professor Dennis Estes, Hachidan, holds a black belt in Danzan Ryu Jujitsu that is recognized by both the American Judo and Jujitsu Federation and the Kodenkan Yudanshakai, as well as a black belt in Daito Ryu AikiJutsu. Prof. Estes began training in 1959, at the age of six years old. He and his father Art Estes began training with Jay Monahan in Pullman, Washington. Monahan Sensei trained in both Kodokan Judo and Shudokan Karate while in Japan and later in the San Francisco Bay area in Danzan Ryu Jujitsu under Prof. Ray Law. On September 17, 2009, Professor Tom Ball was named Senior Professor by the AJJF Board of Professors. Dennis is certified in both Utah and Idaho as a Police Instructor, and while in Idaho he taught at the Police Academy. Dennis has taught both basic recruit and in service classes. Dennis is a certified instructor in PR-24 Baton, Kubotan, Arrest and Control Techniques, Self Defense, and the Lindell Method of Handgun Retention. Dennis received National Certification as a Police Self Defense Instructor. He was a training officer in the above topics for Lehi City Police Dept., Lehi Utah as well as teaching In-service classes in other Utah jurisdictions. Over the years Dennis has been in demand for his Police Defensive Tactics Seminars as well as civilian self defense classes. In 1986 Dennis moved to Eureka, Ca. and within six months had started a new dojo. This one he named JOBU SHIN KAN, which translates as School of the Strong Martial Spirit. This school has produced more than 21 black belts, 5 of which were charter members.